Yesterday was European Day of Multilingual Blogging which gives bloggers a chance to highlight the multilingual dimension of the internet. The idea is to feature one or more languages on your blog that you don’t normally use (thanks to Christine Schmit and J. Scott of Word to Deeds for indirectly bringing this to my attention). 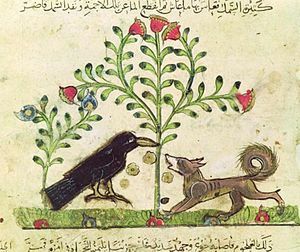 So, here, a day late, is my small contribution – the Aesop‘s Fable The Fox and the Crow in Reunion Creole (it’s not been translated by me – see here for source). Note that as a mainly spoken language Reunion Creole does not have a universally accepted writing system; I’ve chosen to print using the ‘KWZ’ writing system, so-called because it makes strong use of the letters K W & Z. Other systems called Tangol and Lekritir 77 also exist. Té tyinbo dan son bèk in formaz. « Wopé ! Adyé, Misyè Korbo.Ou lé byin zoli ! I arsanm ou lé gadianm ! Li rouvèr gran son bék é li kit son manzé sapé. La ziré, soman tar minm, k’i ginÿ arpi trap ali.